The theme right now for my academy mastermind members is spring cleaning so I thought I would share some tips to help you calm the chaos. We all have some issues with clutter and it is easy to let these things get out of control, which is why we need to set aside time to organize and maintain our space. We all know that physical clutter affects our productivity in a negative way. It causes stress and affects our brains’ ability to process information. If we are constantly looking for things or feeling stress from the clutter we can start to feel like we have no control over our environment, which chips away at our confidence, our mood, and our productivity. It should come as no surprise that clutter can be an issue, so let’s talk about how to clear the clutter and my process for getting organized. I basically grab a box, I have these nice ones I found at Ikea, and I put everything in the box. The object is to contain everything in one place so that you can manage it. This creates some immediate relief to focus on current projects so that you can process what is in the box at a later time. If a task will take me 5 minutes to do it, my rule is to do it. If it will take longer, I add it to a task list for later or to assign to a member of my team. 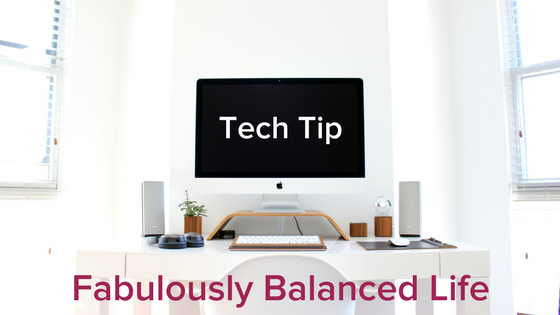 For today’s tech tip, I’m going to share three different systems I have used to manage tasks. You can choose what is right for you. Teamwork: For business-related tasks, either for my clients or myself, I enter the tasks into Teamwork. Teamwork is a project management tool that allows you to collaborate with other members of your team on projects and tasks. GQueues: For personal tasks, I generally add them to GQueues. GQueues is a task manager for Google and GSuite users. It’s more of a task manager than a project manager, which is why I like it for personal tasks and reminders. Trello: I also use Trello for our local Polka Dot Powerhouse chapter which helps us manage workflows among members of our leadership team. Regardless of the system you use, getting everything onto a task list will allow you to prioritize your work, schedule activities, collaborate with others and most importantly get it out of your head and off your desk so that you clear both the physical and mental clutter. To Scan: Almost everything we need to keep is scanned in and stored on Dropbox. I batch my scanning and do it in one, usually weekly or bi-weekly. To Pay: This file doesn’t get used too much. Most of my banking is done electronically, but every once in awhile a statement or other item to pay lands in this folder. To Do: This is everything else that may need to be addressed such as school forms and paperwork. Just like our physical clutter, those disorganized files, a messy desktop, an out of control inbox all affect our mood and our productivity. Next week, we will focus on how to clean up your digital clutter. WONDER WHERE YOUR TIME GOES?